The bridges of New York City — landmarks of the Big Apple's skyline and symbols of the nation's multibillion-dollar transportation system — are a major focus for security officials as the anniversary of 9/11 looms. The target of terrorist plots in the past decade that range from severing suspension cables on the Brooklyn Bridge to blind sheik Omar Abdel-Rahman's plot to obliterate the George Washington Bridge during rush hour, the bridges are difficult to protect because of their highly accessible spans across prominent waterways. 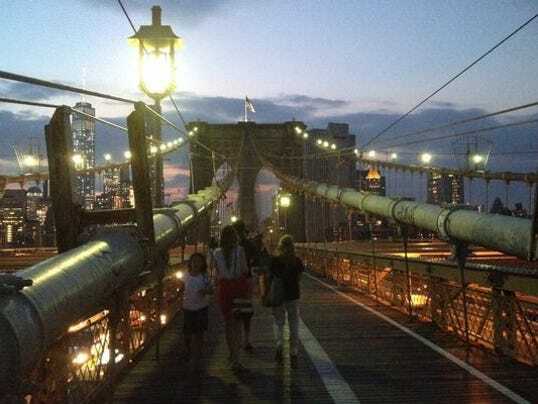 Recent breaches on the Brooklyn Bridge and the nearby Manhattan Bridge have brought heightened security alerts. Thirteen years after the World Trade Center attacks, the incidents have shown it's not impossible for people to find ways to go where they are forbidden. On July 22, two German artists hoisted white flags atop two towers on the bridge. "People climbed the bridge, and it took hours to accomplish that task," said Manny Gomez, a retired FBI special agent and New York Police Department sergeant. 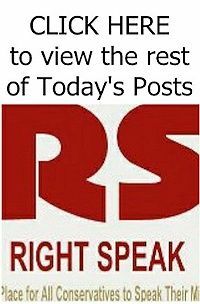 "What could terrorist groups have done in that multi-hour time period with a dirty bomb, a nuclear bomb or a chemical device?" The latest breaches underscore why there is such sensitivity around the bridges, which security documents show have been identified time and time again as the holy grails of terrorist targets. Gomez and other experts warn that officials need to focus more on protecting New York's bridges. 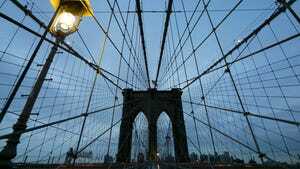 The more iconic crossings such as the Brooklyn Bridge and the George Washington Bridge could be targets because they represent Americana, much like Yankee Stadium or the Super Bowl.